As I’ve pointed out, since Ryan Alley lost on November 3, we’ve had a carousel of consecutive one-day champs. When Ann Conger returns to defend on December 8, she’ll be the eleventh player at Podium #1 in as many regular games. According to the data on J! Archive, that’s the second-longest streak of the post-Ken Jennings era. The longest? 14, set in March-April 2009. * There are two other streaks of 11, including one ended by Stephanie Jass. There are holes in the J! Archive data prior to Season 21, so there could be longer strings out there. Stefan Goodreau made me aware of a 15-player streak between seasons 18 and 19; the first five games are missing from the Archive. With that in mind, I struck out to find the longest periods of time between various win totals since Ken Jennings lost on November 30, 2004. Perhaps it’s time for me to remake my carousel video. Even more surprising to me: nearly two years(!) passed without a mega-champ between Kevin Marshall and Dan Pawson. Note about the counting: the streaks start the game after the first champion’s loss, and end when the second champion reaches X wins (excluding that game). *The ninth champ on that list, Priscilla Ball, had won one game previously, but was unable to return for the subsequent taping session due to illness. The game during this streak, therefore, was her second victory. †Bob Mesko won 5 games during this drought in two different spans: 1/23-1/25 and 4/17-4/18. He was brought back after a poorly worded Daily Double on a Penultimate Wager likely cost him his fourth win. See Kelly’s note in the comments. ‡Streak from before Season 20, suggested by “Guest” in the comments. Looks like the record of longest stretch without 5-time champions will be broken on Tuesday the 16th. Never even thought about it until finding out about this page. That 84-game streak without a 4-timer in 2006 is not valid – Bob Mesko won 5 games in that timeframe (but it was split up due to a faulty ruling in his fourth game and then being invited back later). Likewise the 85-game streak without a 5-timer. Thanks for pointing those out, Kelly. I’m going to leave them in with a note, because I was looking at consecutive games with the same player. The official number for the recent superchamp drought is 156 games (last 34 games in Season 30, first 122 games in Season 31). If Claudia Corriere ends up winning at least 4 games, would the current 4-timer drought end or keep going like the Bob Mesko situation? I’d keep the drought ‘alive’ but mark it with an asterisk. Anything earlier, there’s too many holes from unarchived games, but it’s interesting to compare all of these results! 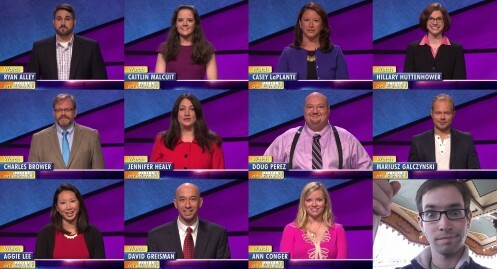 My undying gratitude at somehow being a part of Jeopardy history…cheers! Suffice to say, on behalf of…well…myself, wow.